Director Mamoru Hosoda’s (he started his own animated studio Studio Chizu) MIRAI is his third feature after his studios’s WOLF CHILDREN and THE BOY AND THE BEAST. Again his interest in children and their fantasies are under consideration in his latest tale from the point of view of young Kun, the elder son in a typical Japanese family. When the film opens, Kun is greeted with the arrival of a new born baby sister. Things around the house are altered, as father now tends to the household chores of cleaning and cooking while mother goes on full time work. Emotions like jealousy and anger start to emerge. Kun fantasizes meeting his sister when she is grown up as well as his dog, humanized while shown how to ride a bike by his late great grandfather who was in the Japanese navy. The film’s animation is somewhat similar to Studio Ghibli’s in look and feel, especially since both studios are fond of animal creatures and Japanese folklore. 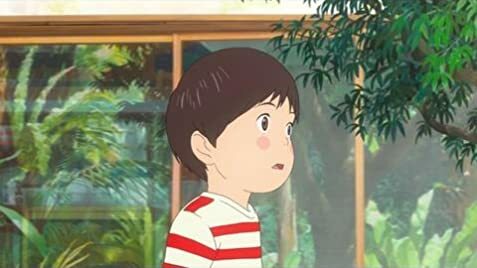 MIRAI is simplistic in its theme, just about a boy growing up, and it is this simplicity that the film works its charm.